When was the last time you changed your rear hubs? - Page 2 - Miata Turbo Forum - Boost cars, acquire cats. It's the hubs that are failing, not the bearings. Correct. My hubs looked to be in good shape (I did examine them when they were out). I cant recall hearing anyone have a rear bearing failure either, but after seeing the condition of mine when they came out, I cant believe they hadnt failed. 2. V8R 3/8" (old). Two known failures, possibly three. Keith and Mike, and potentially a third (not sure if he broke an old V8R hub or a rebroached OEM hub). Not to take away from the discussion of OEM hubs, but (2) has 6+ known failures if you count people outside of CA. IMHO, they are pretty much guaranteed to break in just a few track days. For those considering aftermarket - OEM works and has far more testing than other pieces. I wouldn't jump to aftermarket unless your axle requires it. Andrew, holy crap dude, your hub couldn't have picked a much scarier place to let go than T8 of Big Willow. That was rough just watching it. For a second there it looked like you were going shiny side down. Really glad to see that you're ok, and the car is relatively undamaged. I was speaking with Barry Hartzel (well known CA Spec Miata builder/racer) a few years ago about prepping a car for the track and he mentioned rear hubs specifically as a common failure point for early miatas - sounds like there are probably way more OEM rear hub failures than what you've got on that list Andrew, and all of those on lower powered miatas. I can't remember perfectly now, but I believe Barry said that the early hubs were either cast in a different manner, or made with a different composition of metal that made them weaker than later model rear hubs. Either way though, they can all fail with enough use. I wonder if this is why the 1.6 hubs were phased out? But they list two different bearings. What’s the difference? And why would they list two different options. Every Miata rear bearing I have seen has been ball type not a tapered roller. I have not had good luck with tapered rollers on any other cars. Barry told me the 5 speed trannys were just as strong as the 6 speeds as well. I got a chuckle out of that statement. But it wouldnt suprize me if the hubs got stronger at some point during production. I forget when they changed the stud hole daimeters. FWIW Im still using the small studs front and rear. I can't remember perfectly now, but I believe Barry said that the early hubs were either cast in a different manner, or made with a different composition of metal that made them weaker than later model rear hubs. Either way though, they can all fail with enough use. Interesting. Mazda lists one part number for 90-93 (B455-33-061) and one for 94-05 (B01A-33-060). Both parts are superceeded by B01A-33-060A. So Mazda made an upgrade, but the upgraded parts still fail with enough use. edit: lol @ "5-speeds are just as strong as 6-speeds". That's some Spec Miata Wisdom(TM) right there. Last edited by Savington; 05-06-2013 at 01:54 PM. Glad to see your OK and the car is easily fixable. Thanks for the warning and info. You scared me appropriately into getting ready to order my rear hubs new. I never want to drive another car again after watching those. I saw heat damage/stress on rear flange of my '99 NB. It made the drive from SOCAL to NC when we moved out here last summer. I had a local shop do the hub last summer and they warned me they had been seeing this failure. They replaced the parts and showed me the old one. They also checked the other side and told me it had been replaced by someone else (previous owner). This was a mostly stock NB the previous owner used for autocross around San Diego. It is also my wife's daily driver. My car did indeed have the old 3/8" V8R parts. It was the first track day I'd done on them, as I'd just borrowed them from one of the other FM cars due to some QC problems with the parts I was planning to use. Their history before that includes a fair number of track days on typical 225 NT-01s, but not driven all that hard. I was running a set of 225 RA1s in the video. Before that, I had OE hubs. Here's my broken V8R 3/8" beside the current 1/2" design. It's my understanding that Dean Thomas' broken hub was also one of these 3/8" units. Anyone with older V8R hubs, please check to see what you have. I would strongly recommend the 3/8" ones go in the dumpster ASAP. There's more to the new ones than just material, Shandelle at V8R says that the inner and outer radii were moved apart (axially, I assume) by 1/4" to create a better load path. 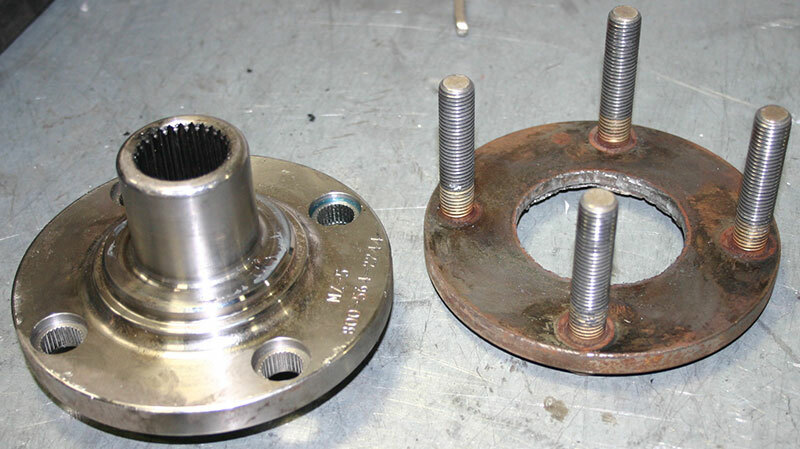 Interestingly, Mazda OE hubs come in at 9mm, so they're thinner and stronger than the original V8R part. Shandelle states he's broken two stock hubs in 12 years of racing Miatas. He says it always starts with cracks on the back side. There are currently 5 cars which are seeing 10-15 events a year on the new V8R hubs, not "babying around and giggling" in his words. Not as big a pool as I'd like to see, but the theory is good. After my failure, I was having trouble deciding if I wanted to go to the 1/2" V8R or go to new Mazda pieces. Andrew's convinced me, I'm going to go to the beefier V8R. The upgrade may not be in the hub design itself, but you probably know they went to a larger spline on the studs in 1994 and that certainly would have generated a new part number. Not sure what the 060A part is. Last edited by [email protected]; 05-06-2013 at 03:56 PM. Sounds as though the every season replacement schedule is common with high end SMers. I know we rib on them but there is a wealth of knowledge in the SM community that isn't shared as publicly. Last edited by doward; 05-06-2013 at 03:10 PM. .. Spec Miata Wisdom® right there. Speaking of bearings, is it possible old bearings have any effects on those hub failures related to high temperature or vibration? I'm stunned watching those videos and am sincerely glad everyone is alright.